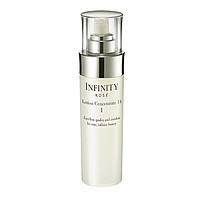 Infinity Lotion Concentrate 14 revitalizes dry, rough and lacklustre skin. A concentrate lotion which supports the skin function by retaining moisture in 14 cornified layers of the skin, strengthening the skin's suppleness. Enriched with herbal extracts, it penetrates your skin's deeper layers with high-quality, lasting moisture that leaves your skin looking so refreshed and dewy.